The Colorado Rockies will enter this season with a bullpen filled with optimism. For the first time in many year’s Colorado’s bullpen seems to have the intangibles to be good enough to evolve from mediocre to consistent. The splashy signings of Mike Dunn and Greg Holland were solid for the Rockies. Those two will likely be considered the anchors of the bullpen if things do indeed pan out. With that said, there are a couple of returning arms that will certainly be focal points of the Rockies bullpen. One of those arms is 24-year-old Carlos Estevez. Estevez’s performance fluctuated in his rookie season. Over the course of last season, the “Wild Thing” managed to save 11 games for the club, posting an ERA of 5.24 in 55 innings pitched. In stretches, Estevez has shown flashes of his potential to be a lockdown arm in the pen; however, has also proved that it is going to take some time to get to the elite level he has toyed with in the past. Estevez spent his offseason back home in the Dominican Republic with his family in preparation for the coming season. Now a full year removed from his first go-around in the big leagues, Estevez is ready to become the shutdown, homegrown arm Colorado has been longing for. Estevez will join Adam Ottavino, Holland and Dunn as the team’s late game arms. The four options the Rockies have at the back end of the bullpen are the best set of late-game arms the franchise has had in some time. The additions of Dunn and Holland have provided the youngster with mentors, guys who have great amounts of experience and success in the league, something that has been beneficial so far. With that, the reality of the matter is that the Rockies have three potential closers with Estevez, Ottavino, and Holland; however, For Estevez, it’s not so much about role or title, but rather what benefits the team most. Estevez’s electric fastball is both his saving grace and biggest issue. When the fastball is clicking, so is Estevez; however, over the course of last season, he struggled with commanding that pitch. 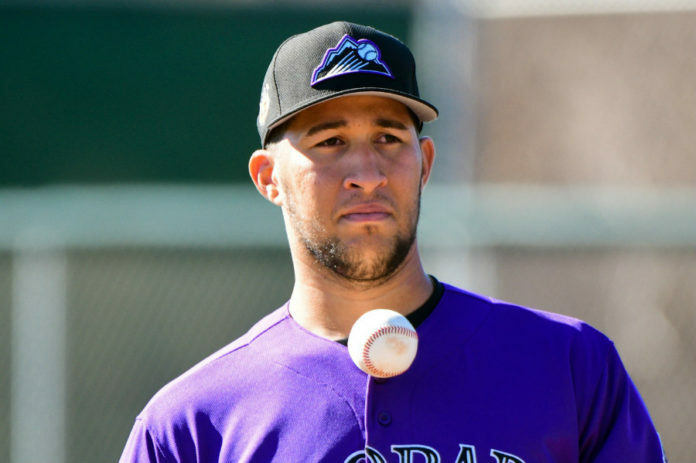 Nevertheless, the potential and ability still remain for Estevez to be part of the foundation of what the Rockies are hoping is a bullpen that will lead them back to the playoffs for the first time since 2009.